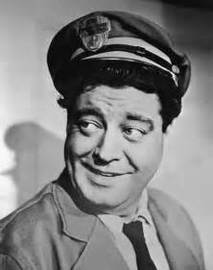 Played by Jackie Gleason—a bus driver for the fictional Gotham Bus Company based in New York City. He never is seen driving a bus (except in publicity photos), but sometimes is shown at the bus depot. Ralph is frustrated by his lack of success, and often develops get-rich-quick schemes. He is very short tempered, frequently resorting to bellowing, insults, and making hollow threats. Well hidden beneath the many layers of bluster, however, is a soft-hearted man who loves his wife and is devoted to his best pal, Ed Norton. Ralph enjoys -- and is proficient at -- bowling and playing pool, and is an enthusiastic member of the fictitious Loyal Order of Raccoons (although in several episodes a blackboard at the lodge lists his dues as being in arrears). The Ralph character was given honorary membership in the union for real New York City bus drivers (Local 100 of the Transport Workers Union) during the run of the show, and a Brooklyn bus depot was named in Gleason's honor after his death. Ralph Kramden is the inspiration for the animated character Fred Flintstone.